The Resident Evil franchise has seen its share of ups and downs over the years, ever since its inception in 1997. What started out as one heck of a scary game — at least for the mind of a then twelve-year-old me — eventually turned into shooters, and the overall quality saw a big dip from which the franchise never quite recovered. Resident Evil 7 aims to bring back the series back to its roots, and in many ways, it succeeds, in some, not so much. In the years following the original Resident Evil, many other games tried to follow up on the premise of offering a “survival horror” experience, with mixed results. What many consider the ultimate competitor to Resident Evil, Silent Hill, started out incredibly solid, only to see a similar dive in success that Capcom saw with each new entry in their once flagship franchise. It was only after the release of the new crop of first-person games like Amnesia: The Dark Descent, SOMA, Slender, and Outlast that the horror genre started getting some of its steam back, and it’s from those games that Resident Evil 7 draws much of its strength from. It also brings back a lot of what made the very first Resident Evil so great, at least in its earlier half, by introducing players to an incredibly atmospheric and creepy setting — a remote property deep in the bayou of Louisiana, where a family of apparent lunatics have taken captive the once believed deceased wife of Ethan, the protagonist — and instituting somewhat of a scarcity of resources, while throwing scare after scare on us. That atmosphere manages to permeate through almost the entirety of the game, even though it loses some of its momentum as it approaches the end, with a shift into more combat intensive and less tense exploration. And as with the recent Resident Evil: Revelations side series, the creature designs in Resident Evil 7 aren’t nearly as striking as they once were. The truly disturbing monsters here inhabit the frames of actual human beings: the Bakers, a bizarre family that’s apparently been behind the disappearance of quite a number of people in the area. Resident Evil 7 opens as Ethan arrives in the Bakers’ doorstep after getting an e-mail from his wife urging him to come. Things quickly turn sour as he’s introduced to the Bakers, who aren’t entirely too keen on having him as a guest. Not shying from series’ tradition, Resident Evil 7’s story goes to some cooky places, leaving plenty of questions and few answers by the end of its eight to ten-hour run. Still, in the overall scheme of things, it works well as a backdrop to the madness, and frankly, making sense has never been one of Resident Evil’s strengths. Having Resident Evil make the jump to first-person isn’t anything new to the franchise, but 7 turned out way better than any Gun Survivor game ever even dreamed of. Then again, the slower pacing helps the perspective change feel plausible and generally realistic, at least during the more grounded moments of the first half of the game, when you mostly just explore and occasionally shoot things, a balance that shifts later on and only keeps ratcheting up. Even in the more action-heavy sections of the game, enemies don’t move too fast, allowing you to react in time, even if at a much dragged out motion than you would in a traditional FPS. 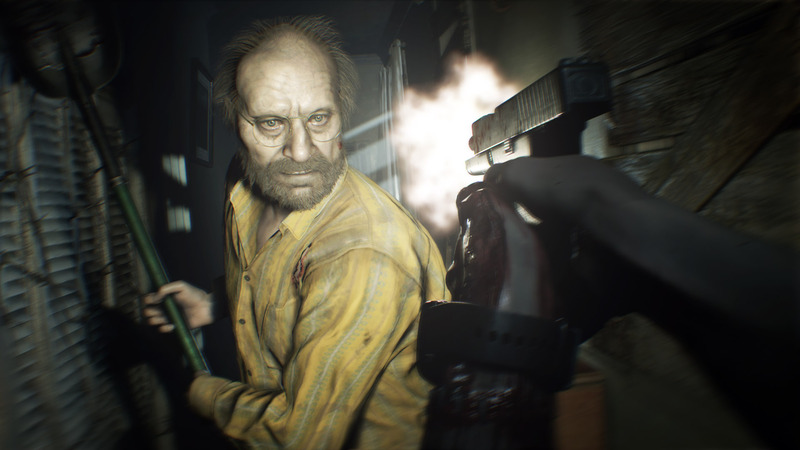 In everything else other than shooting, however, the first-person perspective works wonderfully well, and like all the other horror games I mentioned before, the intensity in Resident Evil 7 is higher thanks to that, since you’re not given any time to react to the many scares it throws at you, especially at the beginning of the game, where Capcom chose to really go out with guns blazing and show off just how tense moments your limited viewpoint manages to provide right away instead of saving it for the climax. And that pacing keeps going full speed ahead throughout the game. Even with the relative breaks due to location transitions and the occasional VHS tape — which serve as backstory material — you’re pretty much on a rollercoaster the entire way through. It really feels like a single horrible night that Ethan has to get through in one piece. Unfortunately for him, the Bakers are all too keen at serving all of his torment and then some. The few boss fights that Resident Evil 7 dishes out are pretty mixed, with the very first being the standout. They mostly take place is small arenas and offer very limited to no extra resources during the encounters, with only one exception which works within the confines of the particular space it occurs. While the visual horror is all well and good, the true villain in Resident Evil 7 is its setting. Thanks to some great environmental design and truly disturbing surround audio, there isn’t an entirely calm moment in this game. Even when swapping items in your storage box while in the safe room — a hallmark of Resident Evil — you’ll always get an aural cue of some kind, be it leaves rustling outside, the wooden floors creaking or even Ethan’s labored breathing after rushing in. 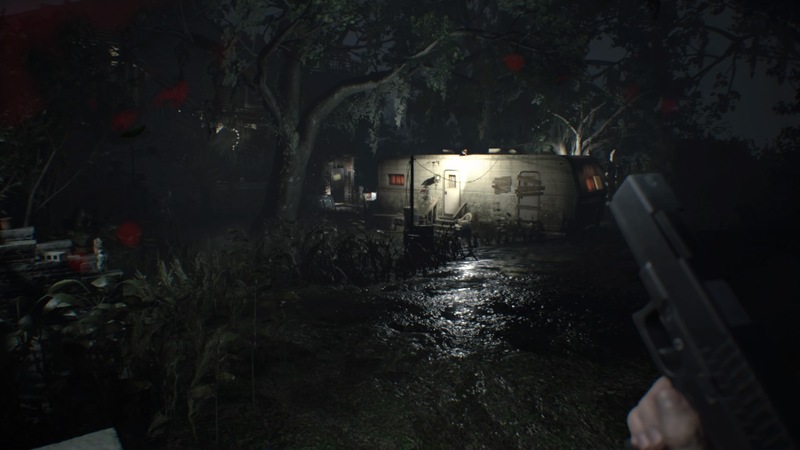 Like Outlast and Amnesia, Resident Evil 7 benefits from being played with headphones or through a good quality sound setup. Be it walking across an eery abandoned dock or mowing down mutated creatures with your shotgun, every moment in this game is exceptionally well characterized by the audio presentation. It’s worth to quickly mention that Resident Evil 7 is available as a virtual reality game on PlayStation VR, but not on PC. I frankly can’t imagine playing a game of this intensity while wearing a headset, but the choice is there for those lucky enough to own a PSVR set. Given how immersed I felt only wearing headphones, I can’t even imagine experiencing the same scares I honestly got caught falling for during normal play only now in VR. For all intents and purposes, Resident Evil 7 is an incredible revival for the franchise. Curiously enough, Capcom’s approach to revitalizing Resident Evil was to take it back to its roots, and that proved to be a sound decision. This is an incredibly thrilling and intense game that even though it loses some of its momentum and breaks up the mood towards the latter half in favor of serving more action scenes, more than makes up for the sheer absurdity of its story and fantastic setting and sense of atmosphere. Previous Entry Nioh Review – The path to mastery is a rocky one, amrita?